What sparked your interest in a story set in Nagasaki? Of the two cities targeted by the atomic bombs, Hiroshima and Nagasaki, why did you choose Nagasaki? In that weird synchronicity of life, an advert appeared in a newspaper looking for graduates to apply to GEOS, at that time one of the world’s biggest English language schools. I got the job and was allocated, at random, the city where I’d be teaching: Nagasaki. Fate, I guess, or luck, led me there. I loved my own small piece of Nagasaki: the curious ramshackle home I rented with the hole in the floor in lieu of a flushing toilet, the tatami mats and paper sliding doors in the bedroom, the tailless cats that loitered on my doorstep, the lack of street names that left me lost on my first night, the temples and shrines and foreigner cemeteries, the food, and the sheer adventure of being dropped into a world so alien I had my own “alien registration” card. I knew I wanted to set my first book in Nagasaki but I was wary about tackling the atomic bomb. It was too big a topic, the devastation real and not imagined, the aftermath still felt by generations of families. However, every time I wrote about the city, the plot—or rather the characters—took me back to the Second World War. And so reluctantly, and cautiously, I began to feel my way towards a story about an elderly woman called Amaterasu Takahashi who had lost her daughter and grandson when Bockscar dropped Fat Man over Nagasaki—and who had lived with that loss for forty years. During my two years living in Nagasaki, I attended the 50th anniversary of the atomic bomb at Nagasaki Peace Park, alongside 30,000 more people who gathered together in the stifling heat to remember the dead. I watched a small boy eat ice cream by a fountain built to commemorate the fatally injured who had cried out for water. I stored the memory of that boy away and later he turned into Hideo Watanabe, the seven-year-old child seemingly killed on August 9, 1945. Decades pass in the book, and a man going by the same name arrives on the doorstep of Amaterasu’s home in the US to declare he is the grandson she thought dead. The adult Hideo has a type of retrograde amnesia and I wanted his condition to reflect a certain historical amnesia that we have in the West with regards to the atomic bombs. Nagasaki was the second city hit. When we talk about nuclear war Hiroshima is more often cited. That’s quite a thing, to have second billing but to have shared the same horror. Beyond inspiring my first novel, Nagasaki has had a huge impact on my life. It gave me my first job as a teacher, later my profession as a journalist—and wonderful memories. On my first night in the city, a sushi restaurant owner, who also happened to be a former boxer, declared: “For as long as you live in Nagasaki I will protect you.” I feel the book is my way of repaying my debt to all the kind people who looked after me when I lived there. They protected me when I was young and a long way from home. Read the rest of the interview after the break. Family and relationships are central to this novel, especially the secrets we keep and the question of how well we can ever know those closest to us. Why did you choose to explore the history of Nagasaki’s bombing through the lens of family? The statistics are hard to verify, people were on the move, the war was chaotic, so we will never know how many people in total died in Nagasaki because of the bomb, but one estimate is 75,000, with half of that number killed on the day. How can one person, one reader, one writer assimilate, comprehend and articulate that loss? The number is too big. So step back, and take another step back and another until you are left with just one family and one single perspective: Ama, a survivor, a hibakusha. I wanted to imagine what happens when personal and public history collide. Ama’s relationship with the bomb is more complicated than just being a victim. She believes herself responsible for her daughter and grandson’s deaths. She feels her actions, her flaws, her determination to try to control the world around her—and those she loves—is the reason they are killed. She drove them to Urakami, the epicenter. When we meet Ama, in her early 80s, she is still carrying this guilt. Why should she get to live when those closest to her die? This is her torment. I wanted to explore what happens when our own “small” lives—the secrets we keep, the harm we try not to do but do, the compromises we cannot bear to make—are overshadowed by one bigger moment that defines us for the rest of our lives. The bomb is the physical force that destroys Ama’s family, but she is also an emotional force that causes untold damage, she thinks. People feel sorry for her because of the former and she hates herself for the latter. Ama lives with her failings every day until a man who claims to be her grandson begins to suggest she can forgive herself, that regret and guilt are not necessarily the end of her own story. That maybe she can allow herself a happier ending. How did you research this novel? Were there any organizations or resources in particular you accessed? I was lucky to meet people involved in peace organizations based in Nagasaki, whose message was a simple one: “Never again.” I also read a lot of memoirs from people living in the city when the bomb dropped. Perhaps one of the best known is The Bells of Nagasaki by Takashi Nagai, a doctor who movingly recounts his experience as a survivor. He also collated other memoirs, the most affecting being, for me, the accounts from children. Another extraordinary resource was Japan at War: An Oral History by Haruko Taya Cook and Theodore F. Cook. This is a stunning compilation of recollections by ordinary Japanese. I used my own knowledge of Nagasaki, my memories of living there twenty years ago: the Dutch Slope, Glover Gardens, the bath houses, the diving platform at Iojima, my own home, they are all places I visited and loved. I also read other novels based in the city: Kazuo Ishiguro’s A Pale View of the Hills and Eric Faye’s Nagasaki are wonderful. David Mitchell’s The Thousand Autumns of Jacob de Zoet is another book inspired by the city’s rich history. I did background reading on the medical effects of the bomb: the different kinds of burns, the signs of radiation sickness, how the doctors attempted to help so many wounded with limited resources. I was specifically interested in how fetuses were affected. Many miscarriages occurred in the aftermath of the bombing, and in babies who were born live, there were reported cases of microcephaly, a developmental brain disorder. I wanted to think about the damage done not just on the day of August 9, but the legacy the bomb left in the bones and blood and organs of the children. I was also influenced by one Japanese doctor who I used to teach who was studying gigantism in children. In the book, Jomei Sato is a doctor working at an orphanage and we follow his research into the medical impact the radiation may have had on some of the children he meets there. 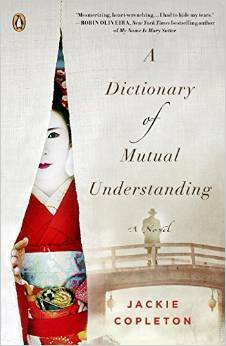 A DICTIONARY OF MUTUAL UNDERSTANDING is set both in more recent history in the United States and, through flashbacks, Japan in the first half of the 20th century. How did you decide to structure the novel this way? Memory isn’t linear so why does story-telling need to be? Our past, present and future are all gloriously, irrevocably, and sometimes terribly linked. My own family history probably also played a part in the structure of the novel. My maternal granddad was killed in Normandy, France on August 5, 1944 and my paternal grandfather fought against the Japanese in Burma, but died before I was born. These men are strangers and yet their legacy lives on through their offspring. My mother will never stop mourning a father she never knew. Two slices of history collide and run parallel: the living cohabit with the dead. How are our lives shaped, or lessened, by such as loss and how can we understand our selves fully if there are these missing chunks in our past? I will confess I didn’t appreciate how tricky the split-time narrative would be. I had endless notes to check that the births, deaths, and marriages aligned. Chapters were shuffled back and forward, others were erased, historical dates had to be slotted in and then worried over. Despite the challenge of weaving the two timeframes, I loved how it helped drive the plot forward, showing why Ama’s present is a product of her past but also how she might carve out a different future. You include Japanese words and their definitions at the start of each chapter. Where are they from? Why did you decide to use them, and how do they relate to the title of the book? What does the book’s title mean to you? When I moved into my first flat in Nagasaki I found two books left behind by the departing teacher I was replacing. The first one was called An English Dictionary of Japanese Culture by Bates Hoffer and Nobuyuki Honna (1986). Each definition appears in Japanese with an English translation and is sometimes accompanied by fairly crude but delightful drawings. I picked definitions from the book to form most of the chapter headings. For example the book begins with a definition of yasegaman (endurance). It means the combination of yaseru (to become skinny) and gaman-suru (to endure), or to endure until one becomes emaciated. The language seemed exhilarating different, so vivid and visual. But beyond the delight of the language itself, I wanted the chapter headings to provide a layer of understanding about some of the cultural mores the characters might be influenced by. I aimed to give readers who were not Japanese a shortcut into that world, a code of sorts since many of the tensions experienced by the characters might be internal ones not expressed verbally. For example, take another definition, sasshi. This can be translated as “understanding” or “conjecture” and refers to the idea that direct self-expression is frowned upon, people are expected to guess what others intend to say. By including sasshi, I hoped readers would understand that what is being said might not be what is being felt. The silences may be where the story lies. The second book is called Nagasaki Peace Trail, compiled by the organization, Mutual Understanding for Peace Nagasaki (MUP). The guidebook provides a history of the city, a walking trail of landmarks affected by August 9, 1945 and a glossary of terms related to the atomic bomb. Seeing the translations of those terrible words—charred bodies, men literally like rags, ruined city—moved me deeply, not just the words themselves, but also the image of a group of people sitting down and wondering: how do we educate people who are not Japanese about the bomb from a Japanese point of view? I think that drive for communication, the need to find common ground, to reach some “mutual understanding” despite differences in language, culture and geography, is a glorious ambition. When we meet Ama she has been living in America for years but her English is still poor. This suits her. She doesn’t want to communicate with neighbors; she wants to be cut off by her lack of vocabulary and grammar. If she can’t speak English, she can’t tell her story. Her journey is about learning to converse with the past rather than rejecting it. Can she reach a mutual understanding with people who are no longer alive? Japanese people might look at the novel and think: “Hmm, so you’ve decided to write a book set during one of the most painful periods of our history from the point of view of a Japanese woman when you don’t speak the language, have not been brought up in the culture and were not alive at the time? Really?” The title is also meant to acknowledge that I am attempting to cross cultures to reach common ground. Clearly I am not a man. I am not Asian. I’m not a soldier. But when I read accounts from Japanese soldiers of those final days of war as they marched, diseased and starving, through stinking jungles and rotting coastlines, I can imagine the suffering. I recall stories of men clinging together in one final embrace as they detonated a hand grenade between them, or soldiers collecting the fingers of fallen comrades so that some part of the dead could be cremated and returned to their families. These men fought against my paternal granddad in Burma, but in those moments of death, I don’t see sides taken, I just see young men dying. I guess that is my attempt at mutual understanding. I hope you’ll be moved and uplifted by Ama’s story but I’m not sure she’d want you to feel sorry for her. I’d hope people might better appreciate the cost of war from all sides of a conflict. I’d hope people would think about the simple questions that tend to get lost among the big political arguments about nuclear arms. Why do we still have these weapons? Can we not imagine a world free of them? Away from war, I guess the book is also about how we love people. Can we love too much, and can that be as damaging as loving too little? Do our regrets grow or diminish as we age? Can we forgive others for their trespasses upon us? More importantly, can we forgive ourselves? Is that not what we all want in the final moments of life? Peace.